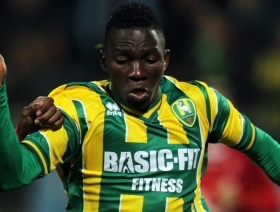 20-year-old Kenneth Omeruo is fast building himself a reputation. The Nigerian international took part in this summer's World Cup and proved to be a tough tackling defender capable of competing with the best. The 20-year-old centre back, who is currently playing on loan for Middlesbrough from Chelsea, joined the Blues back in January 2012 and then was farmed out on loan to ADO Den Haag for the season. Despite his youthful age, he impressed and then finally earned international recognition. Jose Mourinho will be delighted to have the talent of Omeruo among his ranks. He is certainly not ready for the Premier League now, but in Omeruo, Chelsea have a ready made replacement for John Terry and Branislav Ivanovic when the time comes. Omeruo, who already has 17 caps to his name, is comfortable playing anywhere across the defence, but the player admits his preferred position is in the centre. At 6 foot 1, he is tall and good in the air. Omeruo also has a solid presence in the opponent's penalty box from set pieces, as he has proved when he spent a season on loan at ADO back in 2011. With Omeruo, Chelsea will have options for the future. The question is whether or not he will push for a place in the squad under Jose Mourinho, or will he have to wait for a transfer elsewhere.